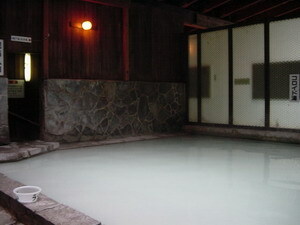 With a huge amount of mud on the bottom of the baths - and in suspension, this onsen is absolutely unusual. It also contains lots of metals : 195 mg of iron and 107 mg of aluminium per kg of water. 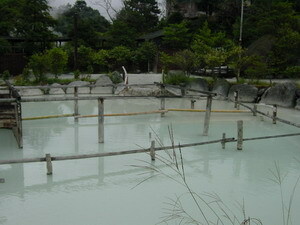 There are two main outside mixed baths: the largest one... is really huge; however, the mud found on the bottom of it is not as sandy as the smaller bath, which is therefore often more crowded... There are other outside baths, too, but you probably will find them less interesting. Note the presence of a small sauna, where the presence of sulfurous vapors is surely going to limit the time you will spend inside there! Although in the nature, the quality of the overall view is significantly decreased.... since the onsen is almost under the bridge of a highway! 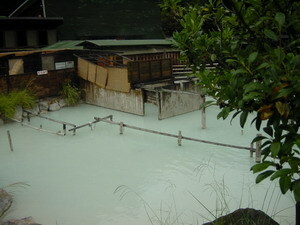 (it is a little exaggerated, the bridge is not that close of the onsen, but it is still really disturbing). There are separated changing rooms and segregated inside bath. Normally, you are not suppose to use a bath towel in the baths (what usually women do in konyoku). Since women can enter in the outside bath in a sheltered area, this should not be a problem: there is so much mud that a towel is really not necessary.